Happy World Sea Turtle Day! 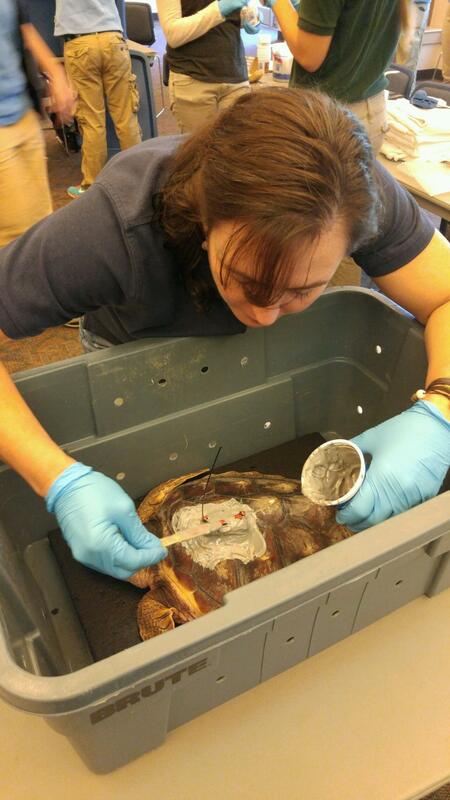 Say hello to Frank, Newport Aquarium’s resident loggerhead sea turtle rescue! Frank the Loggerhead Sea Turtle was rescued from North Carolina and will be returned to the ocean in October. Every year, biologists at Newport Aquarium rescue a loggerhead sea turtle hatchling from North Carolina as part of the North Carolina Sea Turtle Project. Volunteers watch the sea turtle nests to look out for any stragglers who remain in the nest after the other hatchlings have made their way to the ocean. The volunteers rescue these stragglers and send them to aquariums and other organizations around the country for rehabilitation. We joined teams from Mystic Aquarium, Adventure Aquarium (our sister aquarium), Virginia Aquarium, National Aquarium in Baltimore, and NC Aquarium at Pine Knoll Shores. Frank is one of those hatchlings, and he’ll be here at the Newport Aquarium until he’s returned to the ocean this October. Frank may seem an unusual name for a turtle, but there is an inspiring namesake behind it! According to Senior Biologist Jen Hazeres, Frank was named after a very sweet gentleman who was on the boat that went out with her and Water Specialist Cameo VonStrohe to get the sea turtles. As you can guess, the man’s name was Frank! 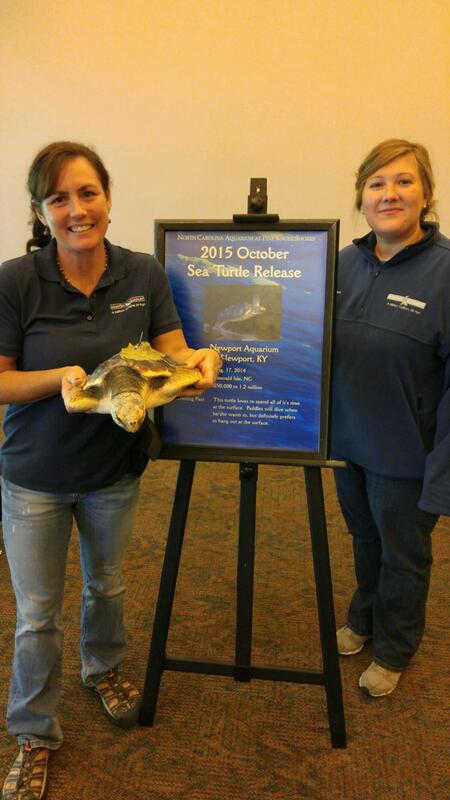 Last fall, Jen and Cameo returned Shack, our previous rescued loggerhead sea turtle, back to the ocean. He was there with his sisters, who were volunteers helping with the turtle rescue. Frank, who has Down’s syndrome, had accompanied them on the trip to see the turtles. Hazeres and VonStrohe got to know them and their story during the trip, so when it came time to name their new turtle, they knew what name they wanted to choose. As part of the rehabilitation process, our biologists and veterinarian take regular measurements and give regular check-ups to Frank. According to Hazeres, Frank is a naturally strong swimmer and diver, which is great news for when he returns to the ocean later this year. Usually, it’s a longer process to make sure that the baby turtles are on par with the swimming and diving abilities they need to survive in the wild, but Frank has been a natural swimmer right from the start, and he’s only improved since! Hazeres and the other biologists will continue monitoring Frank and looking after him during his time here at Newport Aquarium. Frank is fed a diet of an aquatic sea turtle gel food each morning, and in the afternoons, he’s fed fish, squid, or other types of food he’ll likely eat in the wild. Frank receives regular vet visits as part of his rehabilitation. As he grows bigger and stronger, he’ll eventually be moved to the larger tank in the Shore Gallery, next to Shark Ray Bay Theater, so he can continue practicing his diving and swimming. You can visit Frank in the Shore Gallery until he is returned to his home in the ocean this October! A team from Newport Aquarium is in North Carolina, bringing Shack back to Shackleford Banks. After spending this past year at Newport Aquarium, growing and thriving, he’s ready to return to the ocean. Here’s Shack’s homecoming, told from Newport Aquarium Senior Biologist, Jen Hazeres, and Water Quality Specialist, Cameo VonStrohe. Jen and Cameo with Shack, ready for the return to the ocean. A busy day ahead! We started at NC Aquarium at Pine Knoll Shores. The biologists prepared the turtles for the boat journey. It’s the same way we did when we prepared Shack for the trip back to North Carolina – applied an eye salve and ointment on shells and flippers. Newport Aquarium diver, Kathy Folk, joined Jen and Cameo for the release. Newport Aquarium diver, Kathy Folk joined us on the trip, to release Shack back into the ocean. We traveled to the dock at Morehead City. This is where the volunteers (total of about 70 passengers) had a chance to meet and greet the turtles before boarding the Carolina Princess. After about a two hour ride out, we reached warmer waters so it was time to anchor for the release. The water temperature was 74 F, depth 98 feet, latitude 34.27.477, longitude 76.17.969. 33 healthy young loggerhead sea turtles were released about 20-miles offshore – they ranged in age from 2-weeks-old to a 2-year-old. Out on the boat today, to release hatchlings and yearlings, were teams from Mystic Aquarium, Adventure Aquarium (our sister aquarium), Virginia Aquarium and Marine Science Center, National Aquarium in Baltimore, NC Aquarium at Pine Knoll Shores, NC State Aquariums Roanoke and NC Aquarium at Fort Fisher. 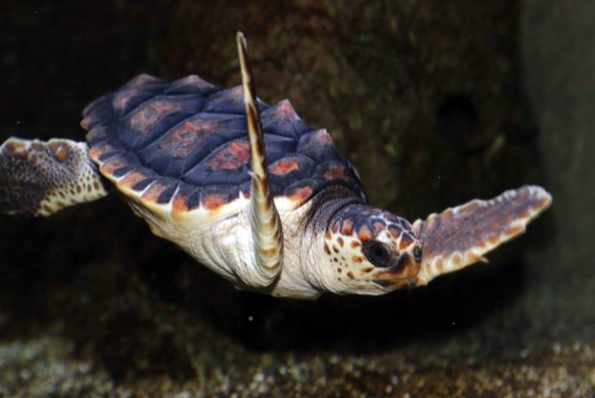 Thanks to NC Aquarium at Pine Knoll Shores, 33 healthy young loggerhead sea turtles were released about 20-miles offshore, near the warm waters of the Gulf Stream. They ranged in age from 2-weeks-old to a 2-year-old. 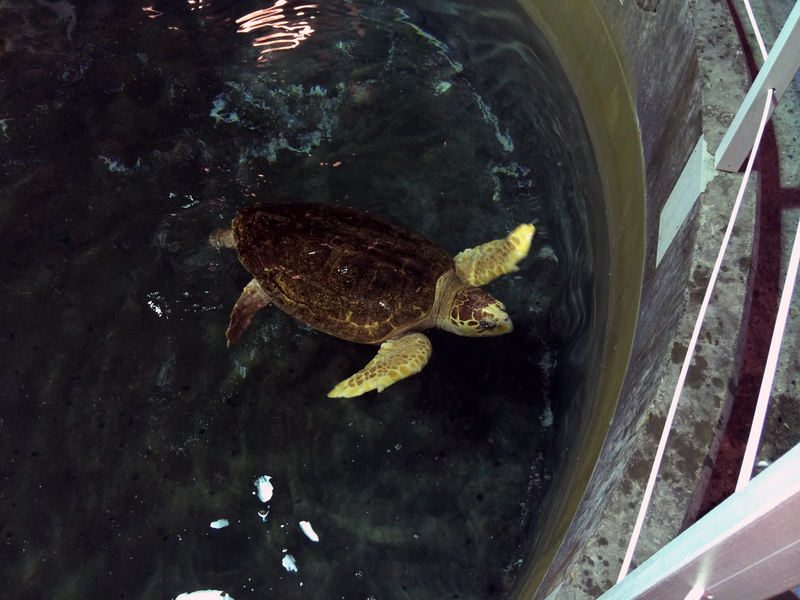 This week marks a big homecoming for Shack, the rescued loggerhead sea turtle. A team from Newport Aquarium is in North Carolina, bringing Shack back to Shackleford Banks. After spending this past year at Newport Aquarium, growing and thriving, he’s ready to return to the ocean. Here’s Shack’s homecoming, told from Newport Aquarium Senior Biologist, Jen Hazeres, and Water Quality Specialist, Cameo VonStrohe. We spent the day collecting salt marsh fish with two biologists from Pine Knoll Shores Aquarium. Jen has her feet in the sand, helps gather salt marsh fish at Shackleford Banks. Cameo (left) gathers salt marsh fish along Shackleford Banks. We caught striped killifish, sheepshead minnows, permit, mullet, and hermit crabs. After a short boat ride to Shackleford Banks, the team anchored then used cast nets. This location happens to be our yearling turtle’s namesake… Shack, where he was found stranded on the beach last year. We took Shack to get a check-up and prepped for a PIT tag. Dr. Matthew Godfrey from North Carolina Wildlife Resources Commission measured Shack’s shell. Dr. Godfrey performed check-ups and took measurements on all of the turtles that are going to be released. Jen holds Shack as he gets his wellness check-up. Dr. Matthew Godfrey, State Coordinator for the Sea Turtle Program, measures Shack’s shell, and prepares to “tag” Shack with the PIT tag. The PIT tag is an injected ID tag that can be read via a reader like UPC code. Biologists and keepers at zoos and aquariums use PIT tags with a lot of larger animals to help identify them from like animals in the same tank – such as sharks at Newport. Jean Beasley gave us a tour at the Karen Beasley Sea Turtle Rescue and Rehabilitation Center. She is a real hero for sea turtle rescue in memory of her daughter. The hospital was incredible, Jean is a huge champion of sea turtles. The pools in the picture behind Jean are full of other rescue turtles. The hospital gets severe medical cases that usually involve surgeries or more involved rehab. Almost all turtles are released. From the hospital’s website: The mission of the Karen Beasley Sea Turtle Rescue and Rehabilitation Center is the conservation and preservation of all species of marine turtles, both in the water and on the beach. We accomplish this through the rescue, care, and release of sick and injured sea turtles, public education regarding the plight of sea turtles and the threat of their extinction, and learning opportunities for students of biology, wildlife conservation, and veterinary medicine from around the world. A nonprofit organization, we view our work as a privilege and are honored to work with these magnificent creatures. Stay tuned for Jen and Cameo’s next post: Shack gets released back into the ocean. Read our previous post: Rescued loggerhead sea turtle ‘yearling’ on his way to the ocean. Shack, a rescued loggerhead sea turtle receives his final exam from Newport Aquarium Senior Biologist Jen Hazeres and Dr. Peter Hill. Shack, the one-year-old rescued loggerhead sea turtle at Newport Aquarium will be released into the Atlantic Ocean next month, as a part of the North Carolina Sea Turtle Project. Shack was rescued last October, as a hatchling on the beach in Shackleford Shoal, N.C.
Only one out of 1,000 sea turtle hatchlings will grow up to be adults. Some sea turtles can lay more than 100 eggs each time they nest. However, a lot of things can stop a sea turtle from laying her eggs. They’re accidentally captured in fisheries. They’re also hunted in many coastal communities, especially in Central America. When Shack arrived at Newport Aquarium, he weighed 73 grams – about the size of an egg from your refrigerator—and could fit in the palm of your hand. After spending a year at Newport Aquarium learning to swim, find his own food and coexist with other marine life, Shack is ready to return to the ocean. He spent the last four months hanging out with the different species of angelfish and other saltwater fish in the exhibit outside Shark Ray Bay Theater, in the Shore Gallery. “He learned how to dive deeper, and he’s gotten used to the environment,” said Jen Hazeres, senior biologist at Newport Aquarium. Hazeres was part of the team that brought Shack back to be fostered at Newport Aquarium. 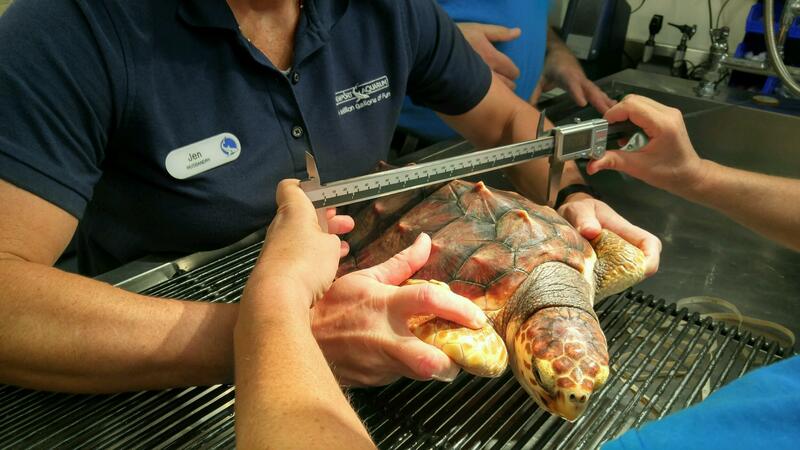 In his most recent checkup, staff veterinarian, Dr. Peter Hill took Shack’s shell measurements, performed a physical exam and weight, and cleared Shack for release. He now weighs almost 7 and a half pounds. Shack explores the tank with his new neighbors. After Shack is released, Newport Aquarium staffers will return to Northern Kentucky with a new hatchling turtle to raise over the next year. Stay tuned for that announcement. WAVE Foundation at Newport Aquarium and Thomas More College welcome third speaker in the Marine Biology & Conservation Lecture Series. The lecture series is part of Thomas More College’s partnership with Newport Aquarium and the WAVE Foundation, which formally began in August 2014 when the school launched its new marine biology degree program, the first of its kind in the state of Kentucky. Dr. Lucy Hawkes, physiological ecologist, is the final featured speaker in the Marine Biology & Conservation Lecture Series May 18th 6 p.m. – 9:30 p.m.
We asked her a few questions about her background, what you can do to help sea turtles, and what to expect in the upcoming lecture series. What is your background? How did you first become interested in sea turtles? I graduated from the University of Plymouth, UK, in 2001 with a degree in Marine Biology and I wanted to get out and do something useful with my degree. I looked widely for volunteering and fieldwork experiences and applied to a seahorse conservation project as well as a sea turtle conservation project in Cyprus (in the eastern Mediterranean) with a UK based organization but didn’t get either position. I didn’t give up though as I had wanted to be a “proper” marine biologist since about the age of 10. I also wasn’t specifically seeking a career working with sea turtles, but I had written one of my final year reports on them during my degree and thought they were really cool because they were so tropical, so enigmatic and SO old! It was just so exotic to someone in a rainy lab in England! I kept looking and then came across an internship at the Bald Head Island Conservancy, North Carolina, monitoring sea turtles nesting on the beaches of Cape Fear. I headed to North Carolina in May 2001 and that’s where it all began. What is the single most important thing someone can do in the Midwest to help protect sea turtles? We know for almost all populations of sea turtles that the single biggest threat to them is being caught accidentally in fishing nets at sea. This can be in all sorts of fishing operations – long lining for tuna, trawling for shrimp and scallops, and gill netting for fish. And it’s not just turtles that get caught in fishing nets, dolphins, seals and all sorts of “non-target” fish (fish the fishermen aren’t trying to catch) get caught and injured or killed too. So, I think that everyone should make a pledge to eat a lot less fish. Keep fish for only special occasions, for example. It’s a controversial debate but it is very clear that almost all fish stocks across the planet are overexploited and we all need to eat less fish, and by doing so, we can also reduce the numbers of turtles being killed! Personally, I don’t eat any seafood at all, and I LOVE cod and shrimp, so it’s a big sacrifice for me! What will you talk about at the WAVE Foundation Lecture series on May 18th? I was really lucky to be the first person to track several populations of sea turtles that we otherwise didn’t know anything about. We would wave goodbye to the nesting turtles of North Carolina, for example, and not really have much of a clue where they would be, come the winter. Actually, tracking turtles started much earlier than that, with great innovators in the 1980s, and since that time we have made lots more discoveries to the point that sea turtles are now probably the best understood of all of the marine vertebrates. I’ll tell the story of how we managed this amazing feat, with some entertaining stories on the way and some lessons for the future! Tickets for the lecture series are $20 for the public, or $15 for Newport Aquarium Annual Passholders and students. Registration for this event is available at wavefoundation.org/education/lecture-series. For the past 10 years, Newport Aquarium has participated in the North Carolina Sea Turtle Project, which gives newly hatched sea turtles a head start by fostering them for one year before releasing them back into the wild. The program increases their chances of survival as only one in 1,000 sea turtles make it to adulthood. Tilly is the baby sea turtle Newport Aquarium will foster this year; her progress is well documented on this blog. In the same animal family as Tilly is Denver, the nearly 200-pound loggerhead sea turtle and one of the most recognizable animals at Newport Aquarium. Denver is not a candidate for release back into the wild because of an injury suffered when he was a hatchling. One of his back flippers is smaller than the other because part of it was bitten off by a fellow hatchling. Additionally, upon his arrival at Newport Aquarium, Denver had to be treated for an air pocket that was caught under his shell, which trapped air and made it difficult for him to properly swim and dive. Denver gets fed 5-6 pounds of fish/squid every day. 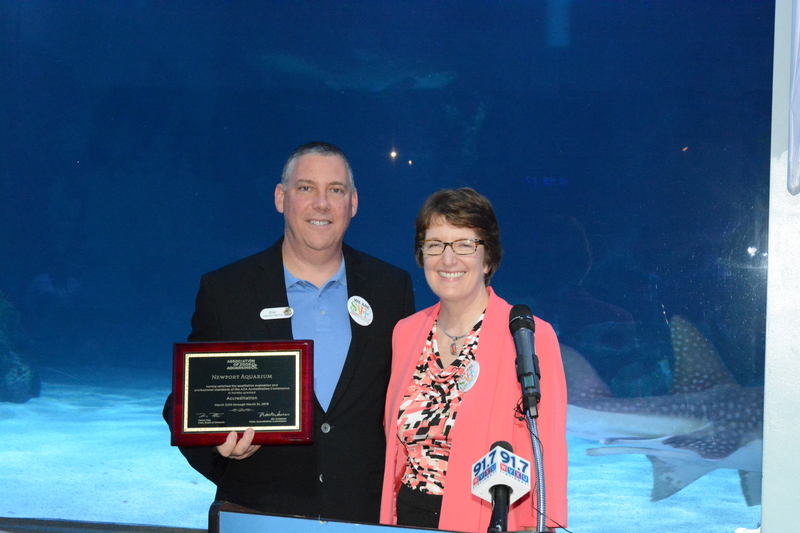 Now vigorously roaming the waters of the Surrounded by Sharks exhibit for nearly the past 12 years, Denver serves as an ambassador to Newport Aquarium’s animal rehab and conservation efforts. He is widely considered the “boss” of the 385,000-gallon tank as his neighbors – four shark rays, tiger sharks, zebra sharks, stingrays and nearly 300 fish – yield to him when crossing paths. Denver, who is approximately 19 years old, was aptly named because in the fall of 2002 he came to Newport Aquarium from Denver Aquarium. With a shell currently measuring approximately three feet in length and approaching 200 pounds, Denver weighed close to 145 pounds and was half the size he is now when he moved to Northern Kentucky. Denver swimming in the Surrounded by Sharks exhibit. The average weight of an adult loggerhead hovers around 250 pounds, however Newport Aquarium biologists believe Denver will remain closer to the 200-pound mark because of his diet, which consists of 5-6 pounds of fish and/or squid each day. Three of the largest turtle species in the world will be on display at Newport Aquarium when the new Turtle Canyon exhibit opens March 22, 2014: Denver; Bravo, a more than 600-pound, 84-year-old Galapagos tortoise and the largest turtle in the Midwest; and Thunder, a 118-pound alligator snapping turtle.